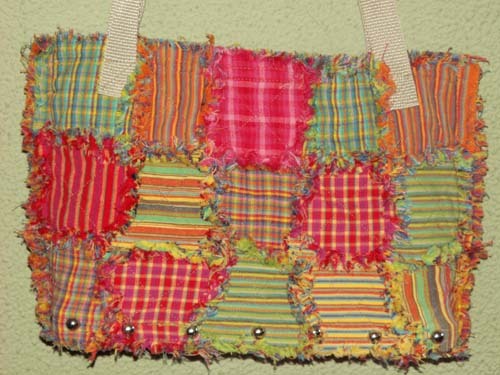 This ragged and patch worked homespun purse is made from 4" homespun quilt squares with a wooden base and webbing straps. This purse is super fun and easy to assemble. 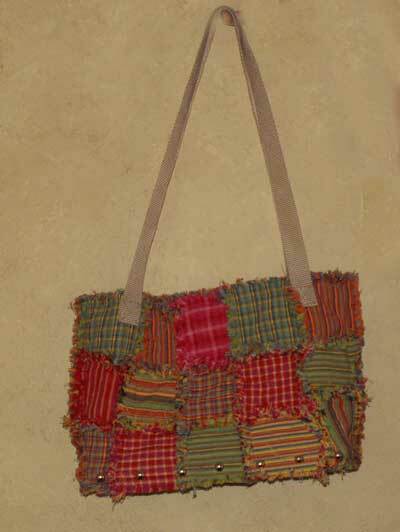 It is shown here using the bright homespun fabrics. Also looks great in warmer and richer colors as well. See more pictures and instructions below. Assemble the homespun fabric squares into 30 individual quilted squares, rag quilt style. Back stitching to secure the seams must be done 5/8" from all edges. Otherwise the back stitching will be lost when the homespun "frays". Set the squares together with 5/8" seams to form the front and back panels, being sure to keep the batting inside the stitch line. Batting should NOT extend into the seam allowance. . Each panel should be 3 squares by 5 squares. Any optional pockets or embellishments could be added at this time. Stitch the front to the back. Stitch 5/8" from the top edges and the bottom edges. Clip all the seam allowances 1/2" deep and 1/2" apart. Be very careful not to clip into the stitching. Add the handles, folding under the raw edges and stitching to the outside. Length of the handles is personal preference. Stitch handles VERY securely. Stitch a piece of Velcro to the inside of both front and back for closure. Machine wash on cold using detergent and fabric softener. Shake well before drying to remove any loose strings. After drying, insert the wood base into the bottom. Some stretching may be required. Hot glue into place and then secure with upholstery tacks.